Jupiter has a brand-spanking new baby red spot (the left-most red circle in the above photo). The red (and white) spots seen in Jupiter's atmosphere are storms. Or big UFOs. Or something. It depends on who you talk to. 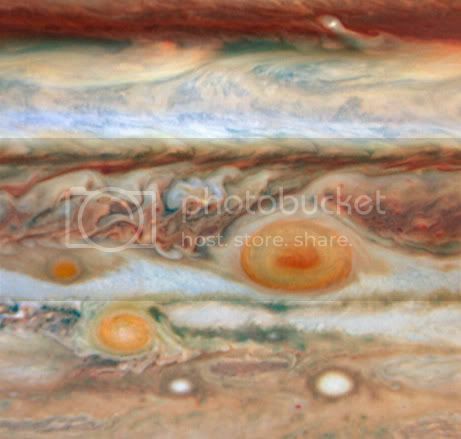 The "Great Red Spot" (that's the big 'un in the pic) is about the width of the Earth and has been in existence for quite some time -- Giovanni Cassini described it in the late 17th century. A smaller red spot (tiny -- size of Mars) popped into existence sometime in 2006. The new guy is less than a year old -- maybe only a few days old. One possible cause of the proliferation of spots: climate change. Note: questions have been raised about the size of the Great Red Spot. It's pretty common in textbooks to say that the GRS is "three times" the size of the earth, but there's a few problems with that. 1) The GRS is dynamic -- it grows and shrinks in size over time. 2) There's a definition problem: are the edges of the GRS defined strictly by the red element, or does it include the white corona around the red center? If you note how the white element "tails away" from the central (red) storm center in some photographs, then it can drastically increase the width of what you might reasonably describe as the red spot. But even including what I say above, after further review of several sources, I'd have to say the the GRS is easily wider than earth. A pretty good example of the level of confusion you have here is the wikipedia article -- which says the GRS is "large enough to contain two or three planets the size of Earth" in its text -- and then has an image comparing the GRS and Earth which shows a GRS that does not seem that big.